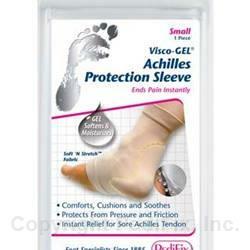 Achilles Protection Sleeve comforts, cushions and protects the achilles from pressure and friction. For achilles tendonitis, bursitis, heel prominences, pump bumps (Haglund's Deformity), and any tenderness or redness at the back of the heel. Also moisturizes dry skin, as proprietary Visco-GEL® releases mineral oil and vitamin E. Gentle compression of sleeve speeds healing. Slim design fits in most footwear. 1 per pack. Wash and dry foot. Slip sleeve on so that gel pad is placed where needed. Remove for at least 3 to 4 hours a day to allow skin to breathe. If you have diabetes or poor circulation, consult your physician before use. If numbness, discoloration, irritation, or additional pain occurs, discontinue use immediately. Do not use over broken or inflamed skin. If symptoms persist, visit a foot specialist.